Why A Course of Love? According to both A Course in Miracles and A Course of Love, love cannot be taught. The explanation for “why” a new Course was needed is almost as simple as that. While many readers of ACIM may have no interest in a “new” course, they often, without realizing why, are yearning to access the love and knowing of their hearts. Each person who brings this yearning to ACOL can experience a loving and loveable Self, and extend this love to a world much in need of it. The coming of A Course of Love is a purposeful continuum of the guidance given in A Course in Miracles. The revelation of “who we truly are” is the goal we seek, often in the guise of something else (such as God or enlightenment). Even the mere idea of knowing who we truly are, knowing ourselves at last, can bring unexpected tears of hope and relief. Each course was received in a similar manner from a source that identified itself as Jesus. In both courses, Jesus does not cloak his identity. Sometimes he refers to himself explicitly, sometimes contextually; sometimes in the first person, sometimes in the third person. According to both courses, the mind projects; the heart extends. It is a natural progression to bring the mind to stillness and then to find the depth at the center of ourselves—the depths of our hearts. One cannot happen without the other. Both are needed. Both courses are lovingly given and eminently capable of fulfilling their intent. A Course in Miracles is a course of mind training and right thinking. 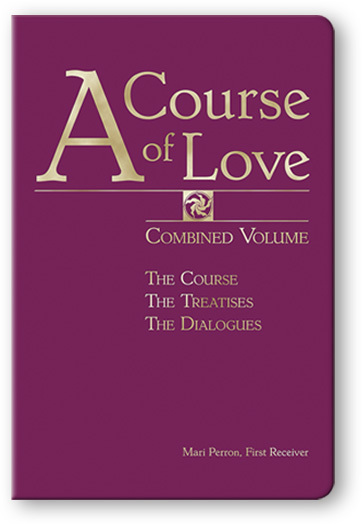 A Course of Love is “a course for the heart” and guides one to wholeheartedness. ACIM moves from the specific to the universal; ACOL from the universal to the specific. ACIM states that as a course it cannot take us beyond the ego. In the Introduction to the Clarification of Terms, paragraph 3, it says: This course remains within the ego framework, where it is needed. It is not concerned with what is beyond all error because it is planned only to set the direction towards it. A Course in Miracles provides daily exercises the purpose of which is to train the mind, to change our thinking about who we are. ACOL uses a different method. There are very few exercises presented. In fact, Jesus says that even the few exercises contained within the text are not required. ACOL contains only one exercise “for the mind” — Dedicate all thought to union. (C:5.20) ACOL is an experiential text. In the concluding portion Jesus provides a powerful experience in “The Forty Days and Forty Nights” on the mountain top: becoming equals, sharing in companionship and dialogue, embracing freedom and power, preparing to return to level ground as a new Self. Similarly, ACOL states: True forgiveness simply looks past illusion to the truth where there are no sins to be forgiven, no wrongs to be pardoned. (C:16.12) Loving behavior follows automatically. ACOL has an identical understanding of forgiveness, but emphasizes the key role of the heart. For ACOL, forgiveness is the first step toward the goal of union, or joining. ACOL advises no study at all and suggests only a short period of teaching and learning after which the “way of learning” ends as our true way of knowing develops. The word “feelings” in its various forms is used 673 times in ACOL. The proper integration of feelings and emotions is a major part of ACOL, which promotes “being who you are” in a way that does not negate the personal self or the vulnerable humanity we each experience. Mari Perron says: “It frankly would have been much easier to present a book unrelated to A Course in Miracles than to meet the resistance of those who feel that there is only one ‘Course’ and it is ACIM. But that can’t be done. It is what it is.” Jesus himself stated what A Course of Love is and gave it its purpose. ACIM and ACOL are sequential. They are complimentary works, but they are different. Some “differences” are due to interpretations of ACIM that have become commonly held, if erroneous, beliefs over time. But most of the true differences are due to our evolution. When the ego has a stranglehold, what Jesus would say would not be the same as when the ego is weakened and we are clear enough to hear our hearts.